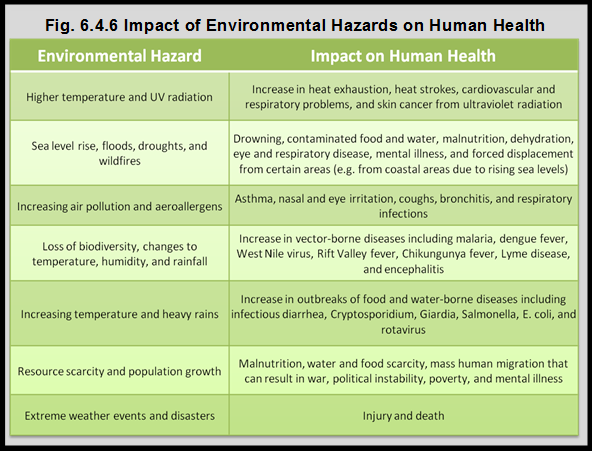 Source: CICH Table created using data adapted from the National Environmental Education Foundation, Climate Change and Human Health. (n.d) https://www.neefusa.org/resource/human-health-changing-climate -accessed July 24, 2017; with information from Committee on Environmental Health (Shannon, M.W., Best, D., Binns, H.J., Forman, J.A., Johnson, C.L., Karr, C.J., Kim, J.J., Mazur, L.J., & Roberts, J.R.). 2007.;and, Policy Statement: Global Climate Change and Children’s Health. Pediatrics, 120. DOI: 10.1542/peds.2007-2645. This can affect thousands of people, including young children, and result in loss of safe housing, food, and water – all impacting health. 1IPCC, 2013: Summary for Policymakers. In: Climate Change 2013: The Physical Science Basis. Contribution of Working Group 1 to the Fifth Assessment Report of the Intergovernmental Panel on Climate Change [Stocker, T.F., D. Qin, G.-K. Plattner, M. Tignor, S.K. Allen, J. Boschung, A. Nauels, Y. Xia, V. Bex and P.M. Midgley (eds.)]. Cambridge University Press, Cambridge, United Kingdom and New York, NY, USA. http://www.ipcc.ch/pdf/assessment-report/ar5/wg1/WG1AR5_SPM_FINAL.pdf-accessed July 24, 2017.